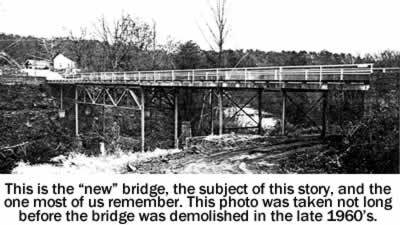 Cliffside, April 27—Work on the new bridge across the deep ravine, and small creek emptying into the Second Broad River here, on the road to Boiling Springs, has been started and is well under way. The structure, the latest and best type of concrete and steel bridge, will be two hundred and twenty-five feet in length and forty-five feet at its highest point. It will have eight concrete piers and two abutments, and is to be a two way bridge with a sidewalk about six feet wide. The steel work is expected to arrive in two weeks and the bridge will probably be finished by the middle of July. The Champion Bridge Co., of Wilmington, Ohio, has the contract and Mr. W.T. Sherrill, of the same company, is the construction foreman. He has, at the present time, a force of twelve to fifteen men, some of them from this County. Some months ago the old bridge was condemned and the new structure is to replace it. With foresight, however, it was decided to eliminate two dangerous curves and the bridge, now in process of construction, will do away with these turns and also give a much better grade on the important highway to Boiling Springs. It is a much needed improvement and one for which Cliffside has waited a long time. The cost of the new structure has not been stated but it will be worth every dollar expended and when the bridge is finished it will be a credit to the County. This item was printed in The Sun on April 28, 1927. Photo courtesy Ginny Ann Reid.